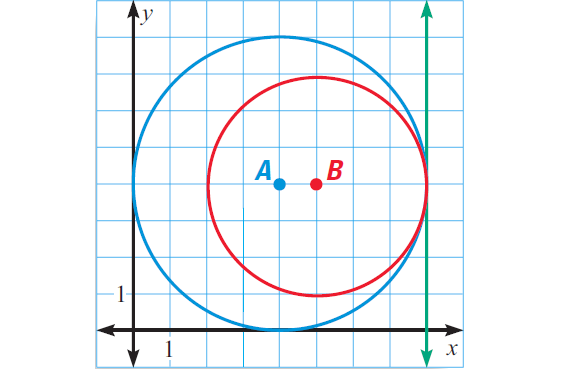 A tangent is a line in the plane of a circle that intersects the circle in exactly one point. Line k in the diagram above is a tangent. The point where a tangent line touches the circle. Point m in the diagram above is the point of tangency. A line or segment that is tangent to two coplanar circles is called a common tangent. If a line is tangent to circle, then it is perpendicular to the radius drawn to the point of tangency. In the diagram shown below, if l is tangent to circle Q at P, then l ⊥ QP. If a plane, if a line is perpendicular to a radius of a circle at its endpoint on the circle, then the line is tangent to the circle. In the diagram shown below, if l ⊥ QP at P, then l is tangent to circle Q. 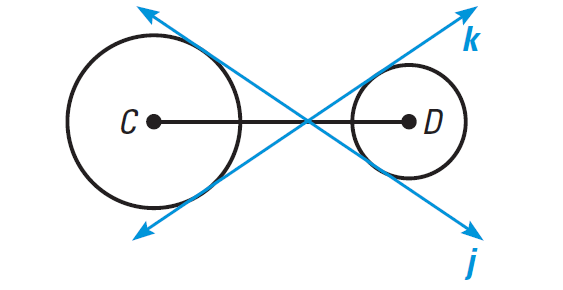 From a point in a circle's exterior, we can draw exactly two different tangents to the circle. The following theorem tells us the segments joining the external point to the two points of tangency are congruent. If two segments from the same exterior points are tangent to a circle, then they are congruent. 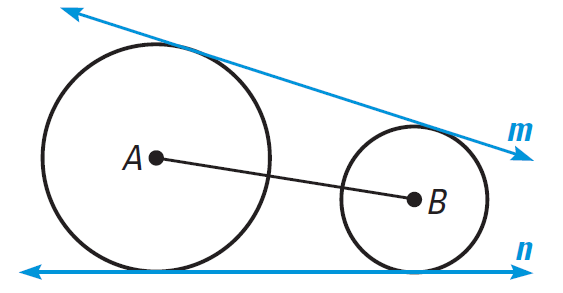 In the diagram shown below, if SR and ST are tangent to circle P, then SR ≅ ST.
Tell which line or segment is best described as a tangent in the diagram shown below. EG is a tangent, because it intersects the circle in one point. In the diagram shown below, tell whether the common tangents are internal or external. 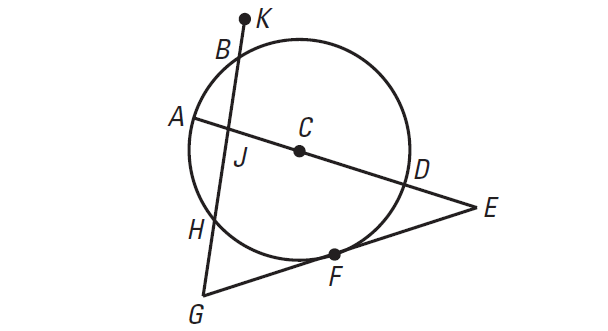 The lines j and k intersect CD, they are common internal tangents. The lines m and n do not intersect AB, so they are common external tangents. In the diagram shown below, describe all common tangent and identify the point of tangency. The vertical line x = 8 is the only common tangent of the two circles. The point of tangency is (8, 4). The point at which a tangent line intersects the circle to which it is tangent is the point of tangency. In the diagram shown below, say whether EF is tangent to the circle with center at D.
We can use the Converse of the Pythagorean Theorem to say whether EF is tangent to circle with center at D.
Because 112 + 602 = 612, ΔDEF is a right triangle and DE is perpendicular to EF. So by Theorem 2 given above, EF is tangent to the circle with center at D.
In the diagram shown below, I am standing at C, 8 feet from a grain silo. The distance from me to a point of tangency is 16 feet. 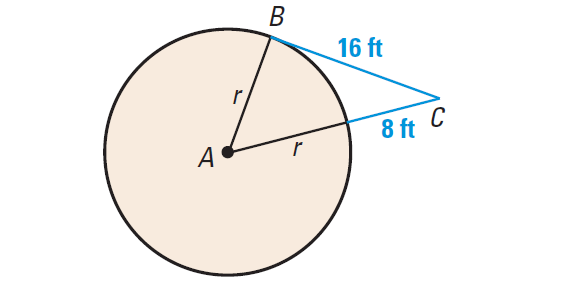 What is the radius of the silo ? By the Theorem 1 given above, tangent BC is perpendicular to radius AB at B. So ΔABC is a right triangle. So we can use the Pythagorean theorem. Divide each side by 16. Hence, the radius of the silo is 12 feet. By the Theorem 3 given above, two tangent segments from the same point are congruent. Subtract 2 from each side. Take square root on each side. Hence, the value of x is 3 or -3. After having gone through the stuff given above, we hope that the students would have understood, "Tangents to Circles".